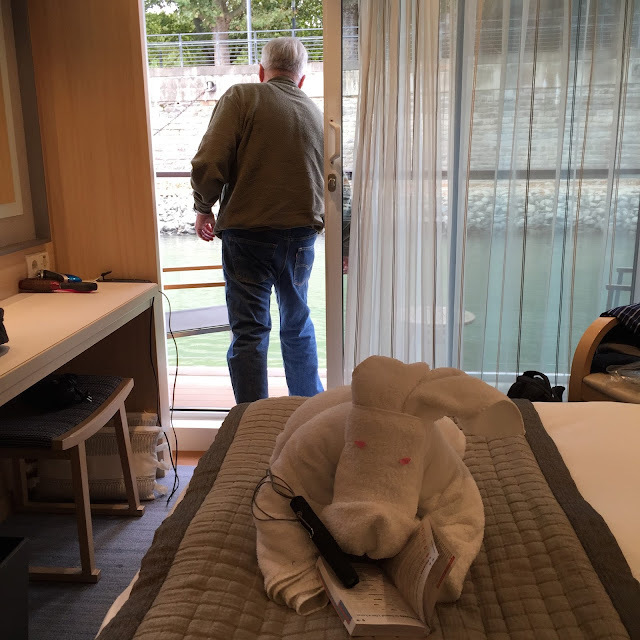 My husband surprised me with an anniversary gift of a Viking River Cruise! 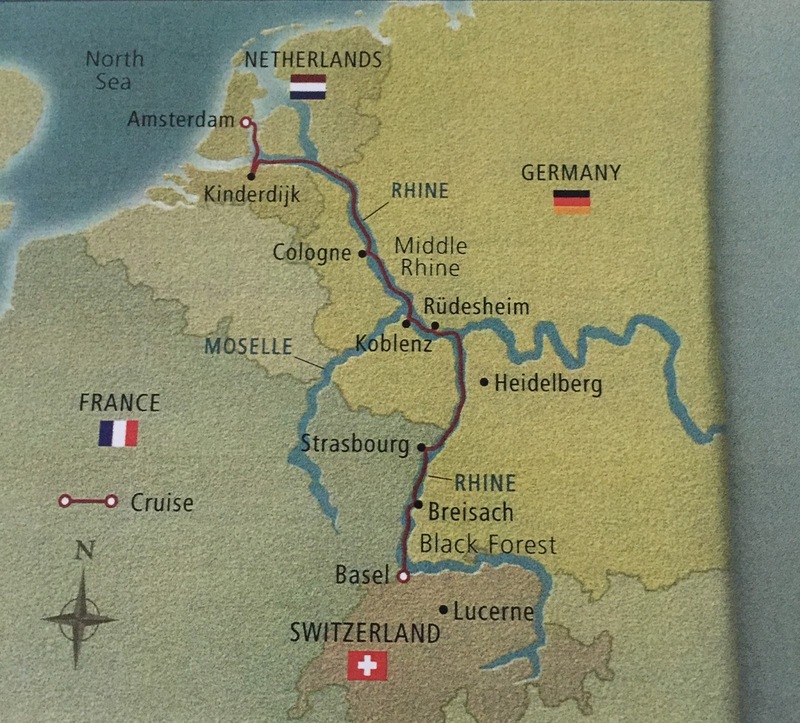 We sailed down the Rhine River through four countries: Switzerland, Germany, France, and the Netherlands. This was a wonderful trip that surpassed my expectations. 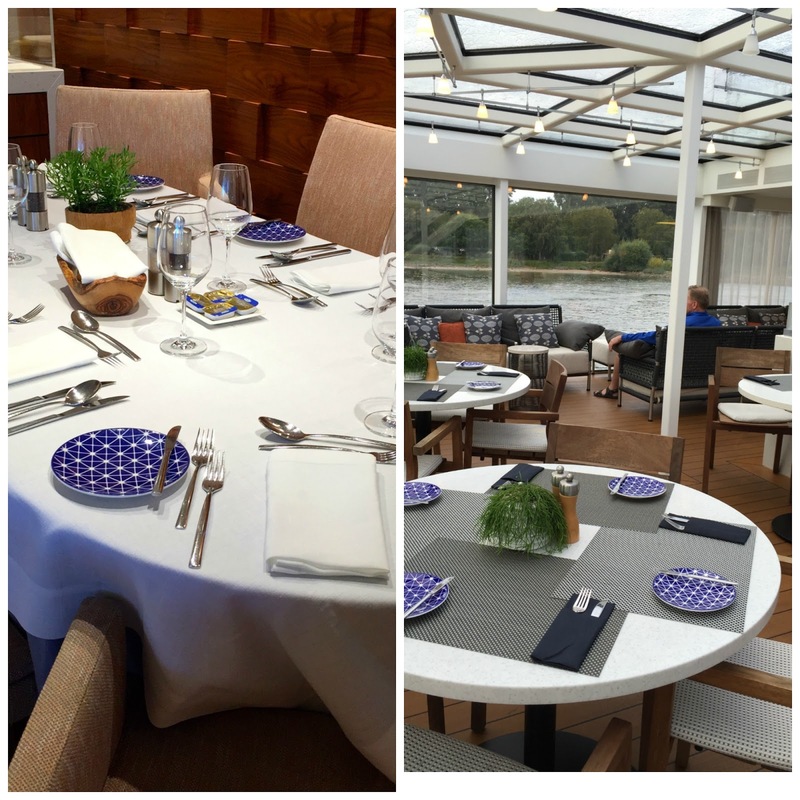 Gourmet meals and excellent service on a vessel that is remarkable for its comfort and elegance! The dining atmosphere was elegant. I was delighted the ships dinnerware was beautiful Villeroy and Boch patterns. I was equally pleased since I love all shades of blue. 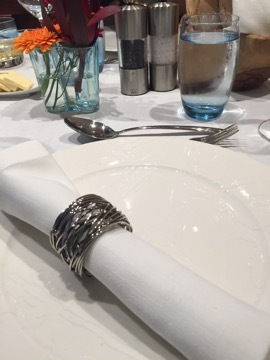 Notice the lovely napkin rings! And that spectacular view! These pics are from the main dining room. The photo on the left is from the main dining room. The one on the right is from the Aquavit Terrace which was a more casual atmosphere but had equally delicious food. I love crisp linen tablecloths and napkins. Breakfast and lunch were served buffet style or you could order from the menu. 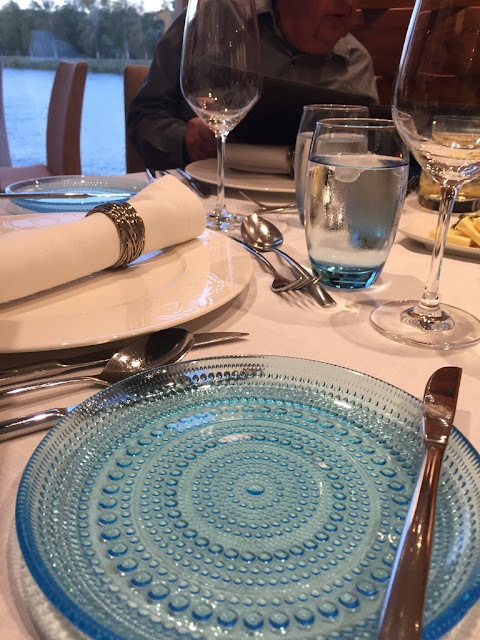 They had every shape possible in all the serving dishes in this Villeroy and Boch white pattern. 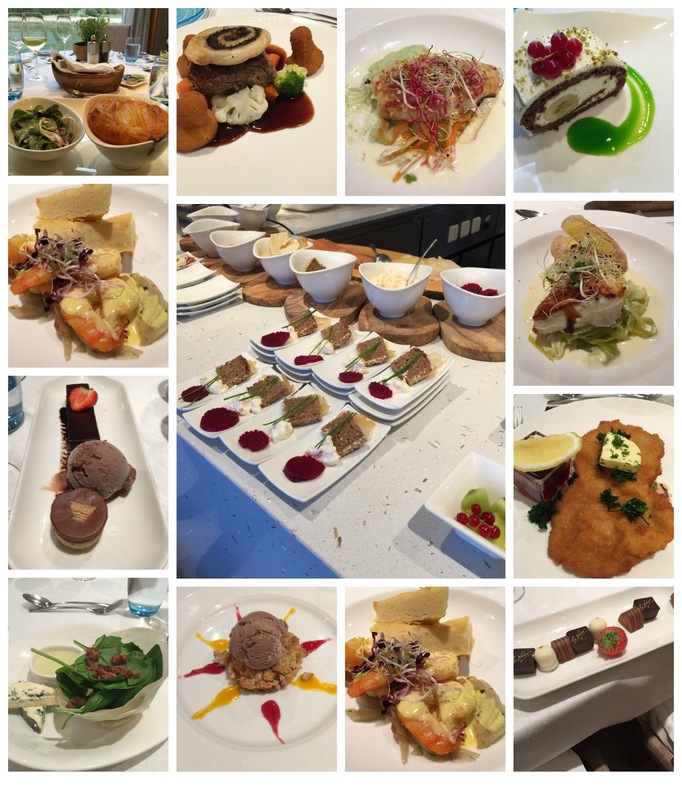 The food and service was superb! 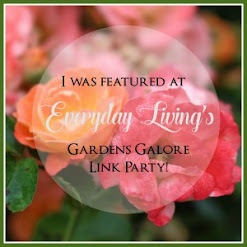 I wish I had taken a picture of the buffet offerings but I was too busy meeting people and enjoying myself! The pics in the collage were snapped with my cell phone that were ordered from the menu. 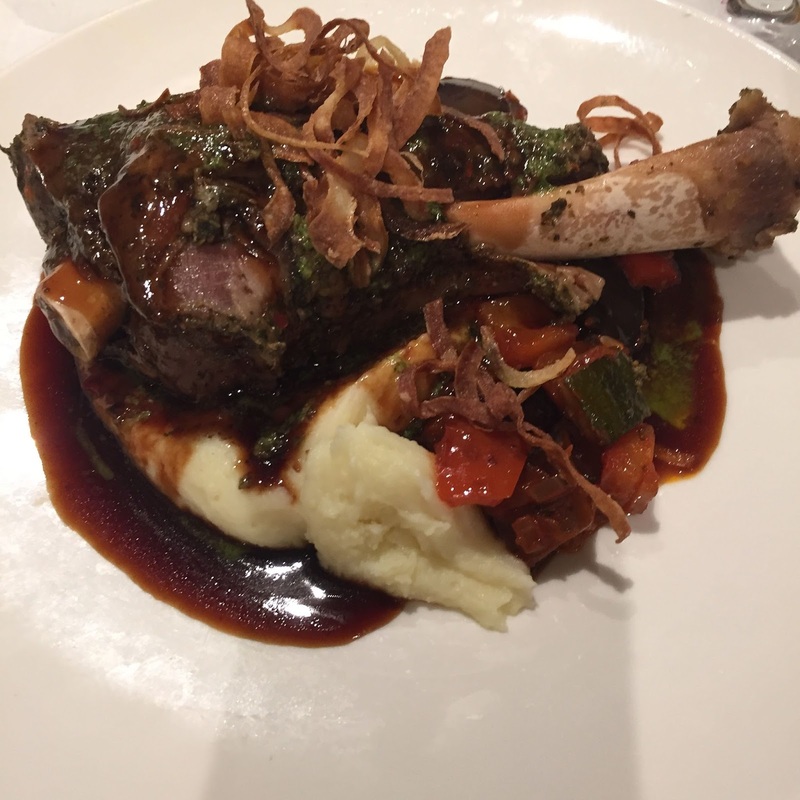 The lamb shanks were the best I've ever eaten! 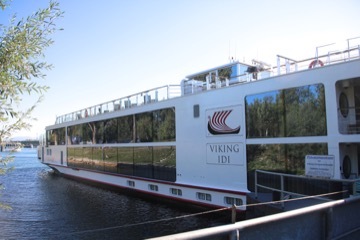 The Viking Idi was our luxurious transport and floating hotel for eight amazing days! 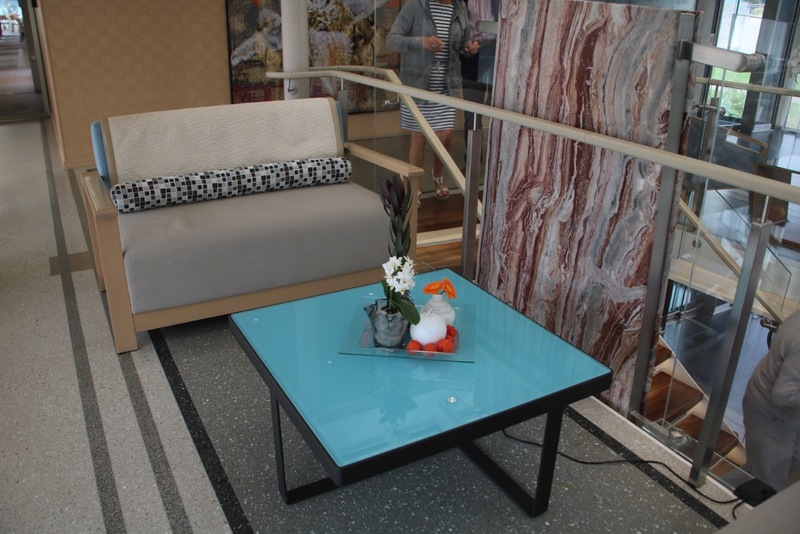 Veranda staterooms allowed a great place to relax with a cup of coffee and enjoy the sites in your own private space. 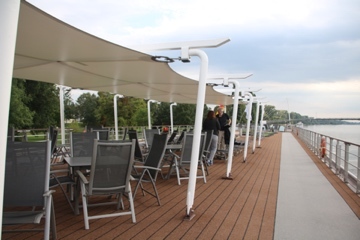 The top deck is a pleasant getaway for viewing and relaxing as well as activities. 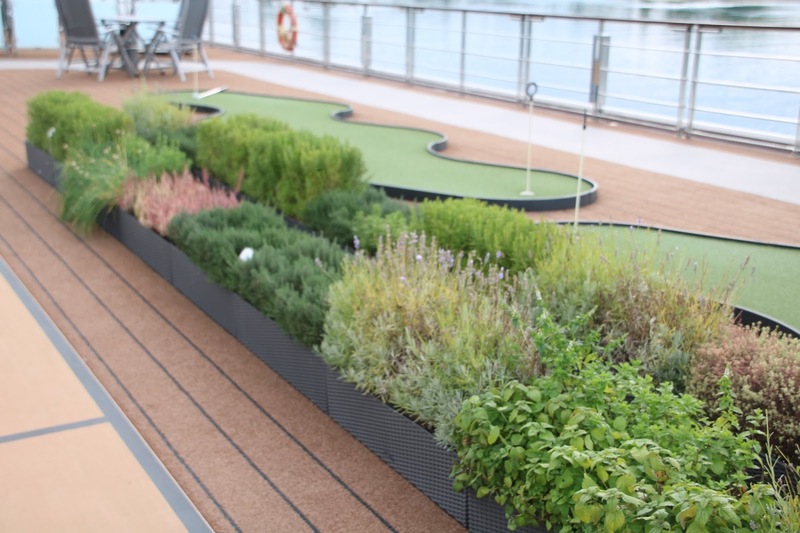 The ship even has it's own private herb garden. 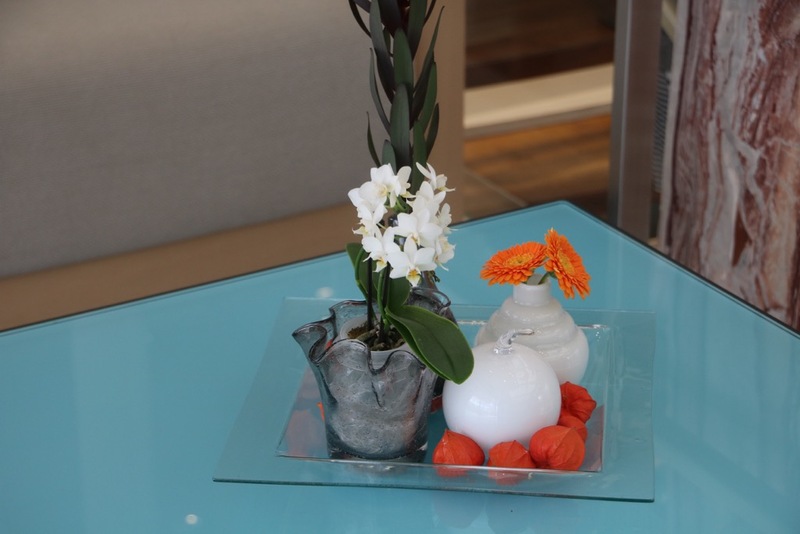 Elegant fresh flower arrangements are seen in seating areas tucked in cozy corners around the ship for reading and relaxing. 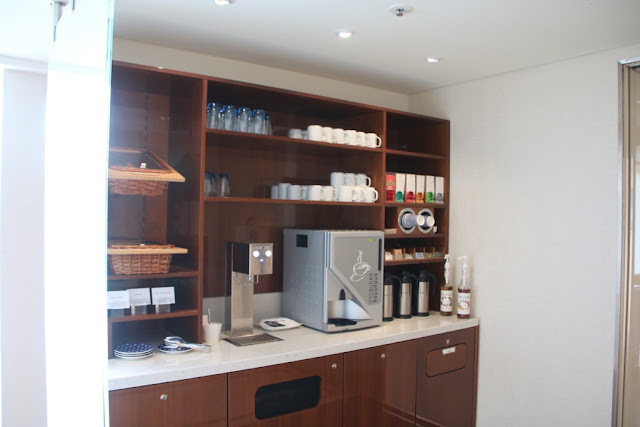 Expresso machine provided a number of coffee drinks and a variety of teas were available anytime at the two coffee bars accompanied by delicious cookies and muffins. I especially enjoyed sitting down with a cup of cappuccino and a cookie perusing their travel books at the library on board. 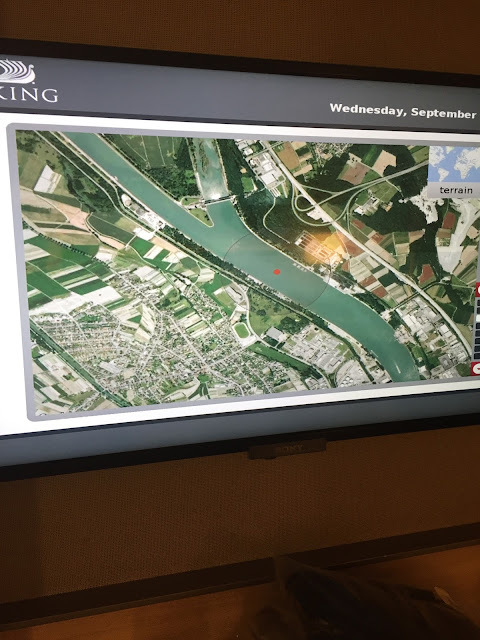 Our GPS position shown on a moving map, one of the technological offerings that delighted my husband. Itinerary and weather information was very helpful each day. Our program director Ryan, was extremely knowledgeable and full of enthusiasm which was contagious. It was impressive that with 190 passengers he called us by name. 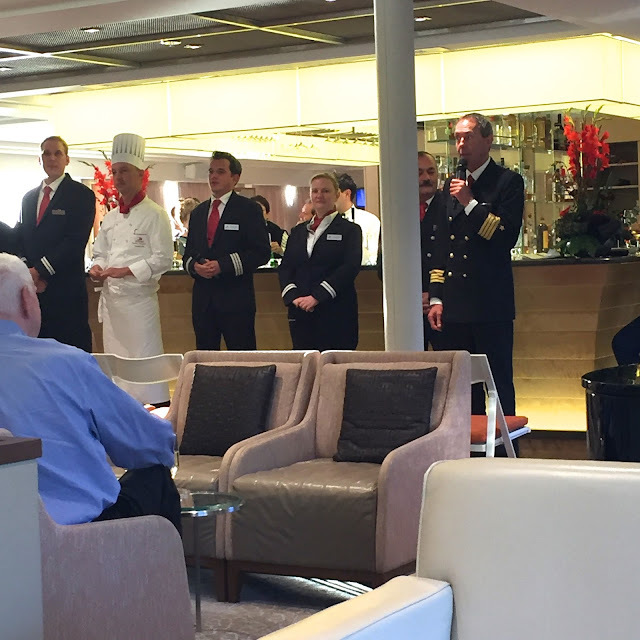 On the first night, the ship's captain introduced the primary crew members and staff. 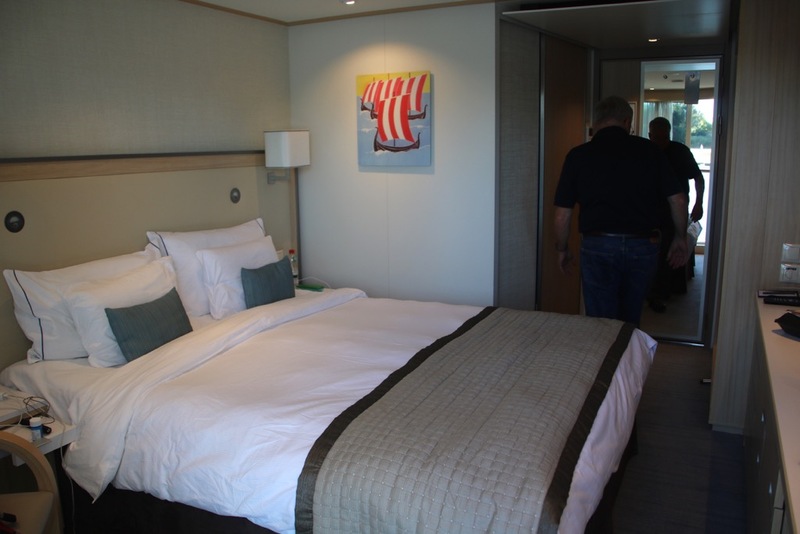 Our room was comfortable with a king size bed and was larger than it looks with more storage than you would expect. Luggage fit nicely under the bed. A little whimsy with the towels one day! The veranda was pleasant and Viking thinks of everything. Pillows and throws are there for your comfort on the veranda tucked under the vanity. The greatest convenience was the dual voltage plugs. No adaptors were needed for charging phones etc. on board! This post was mostly about our ship. Stay tuned to see highlights of the beautiful Black Forest, Alsace Lorraine, historic Heidelberg, the largest cathedral in Europe in Cologne, the Loreley, castles along the Rhine, windmills of Holland and more. 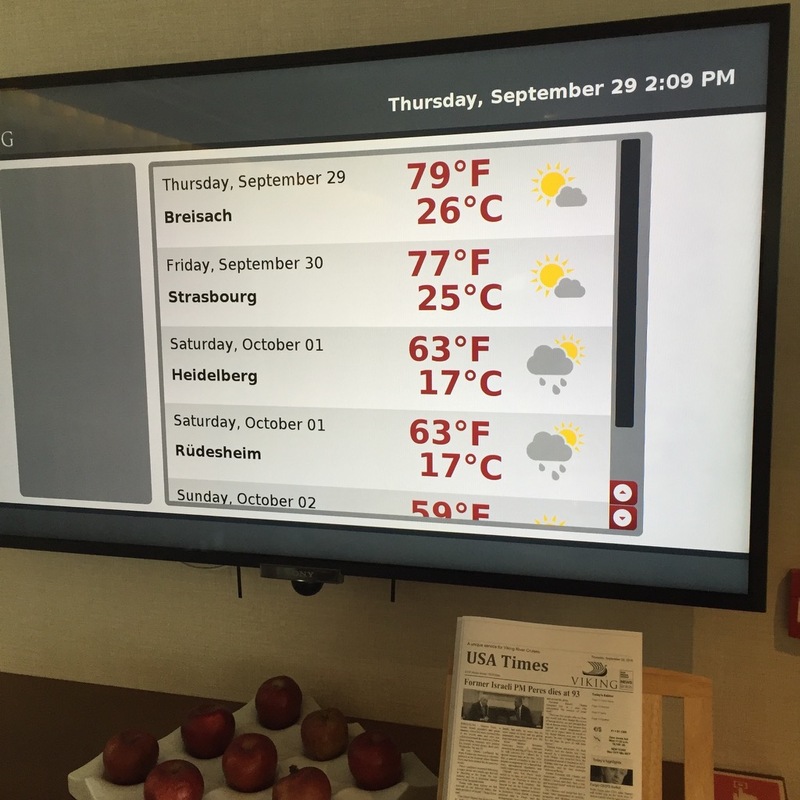 We also visited Lucerne, Switzerland, before the cruise and London afterward. Traveling in the last few years has been such a blessing and bonding for my husband and I. 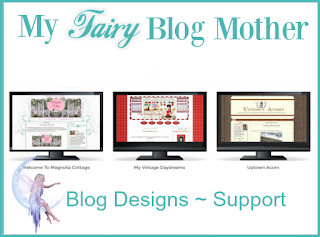 Younger bloggers take time and plan outings with your husband. The years pass quickly with raising children and careers but planning time together is important and special. I am so blessed for 45 years of marriage! Oh Bonnie, thank you so much for all this wonderful information. I have been wanting to go on one of thee cruises. Your trips sounds wonderful and the pictures are great. Can hardly wait to see the rest of you trip. Oh, Bonnie, I just showed these great photos to my husband. What a wonderful trip! I can't wait to hear more about it all. Also, the fact that you did the trips pre and post the cruise, do tell how your husband planned all that when appropriate for the location. For those of us considering something like this, it would be great to know (and anything else you have to offer as advice!). Oh how fun! Amazing trip. Bonnie, I though about you while you were away and missed you at our get together in Bham. What a wonderful and amazing gift from your husband with this trip. I've heard how wonderful these trips are and it sure looks it from your photos. I want to see lots of photos and hear all the details of your trip. Happy Anniversary Bonnie to your your husband. Happy 45 years to you and your hubby, Bonnie! What an amazing surprise that your sweetie planned for the both of you. 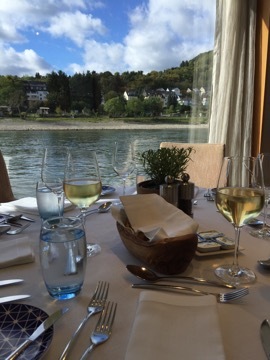 The river cruise looked so spectacular and luxurious, and I look forward to seeing more pictures of the scenery and visits along the way. Oh Bonnie..this is amazing. I love that you and your husband travel together. Hopefully we will get to that point one day soon. I can't wait to see your other pictures of the sights you visited. Happy Belated Anniversary, Bonnie, and congratulations to you on 45 years of marriage!! That's wonderful, especially in this day and age. What a fantastic surprise from your husband; Hal and I have talked a little bit about doing a river cruise someday. It looks like this one was top of the line, and I'm sure you enjoyed every bit of it. You visited some of the very places that we'd like to travel to. Thanks for sharing these pictures with us, and I'm looking forward to the next installation of your trip. Have a great weekend, Bonnie! What a sweet surprise from your husband! That cruise ship looks very luxurious. I've seen them advertising lately. Congrats on your wedding anniversary too. 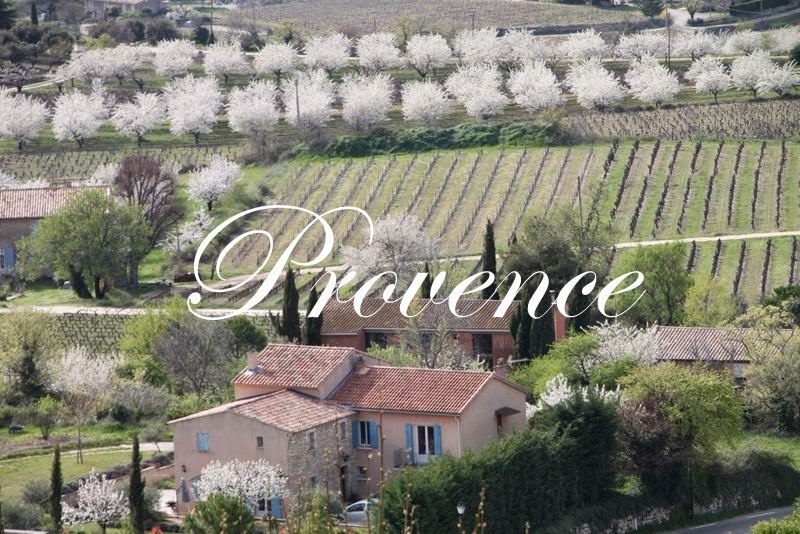 My husband and I are coming up on our 30th next Spring and we are planning a get away trip somewhere. We are still trying to decide where to go. We want to go on a sight seeing type trip where we can fly and then rent a car and visit an area of the U.S. that we haven't seen yet. What a fabulous trip Bonnie! 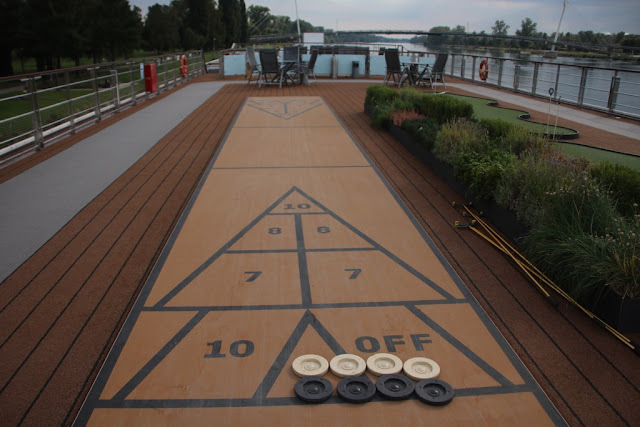 I think those Viking river cruises have always looked dreamy, it's so nice to find out that they are! What a wonderful way to celebrate your marriage, happy happy anniversary, I can't wait to hear more! What a perfect vacation! The food looks so delicious, especially with those views to enjoy. This trip is on my bucket list for sure. Thank you for sharing at Monday Social. What a wonderful surprise, and such gorgeous room you guys got. I am so glad you had such a great time! Oh, Bonnie! This looks delightful. I've been thinking about doing a river cruise. This may be my push! This was a beatific and special time for you and your husband and you are so right about how quickly time flies. Creating those relationships with our husbands is so very important. They truly are our mates that help to steer our ships through life. 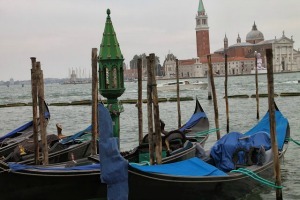 I am so delighted to see these photos and share a bit of your travels with you. 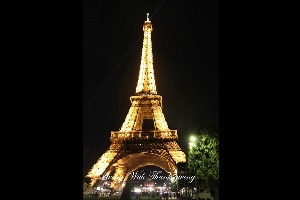 Your Viking ship photos and descriptions are wonderful. 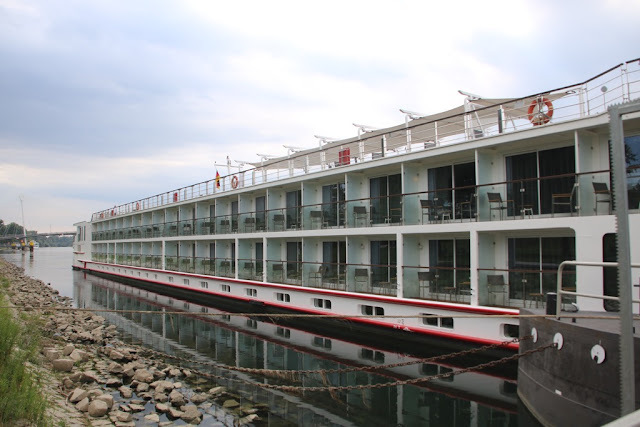 I want to book a Viking cruise now, and I am looking forward to seeing all your pictures of the places you visited. Happy anniversary and welcome home. P.S. I was so excited about your photos that I forgot to say, "Thank you for joining Monday Social. Hope to see you every week." What a wonderful surprise for your anniversary!!! It looked like a most amazing tour....thanks for sharing!....Would love to do one of these river cruises! Bonnie, such a lovely surprise your husband planned. The river boat cruise looks ur amazing. Elegance is everywhere and the food looks so fabulous. Happy anniversary to you both. Thank you for sharing your very romantic getaway. 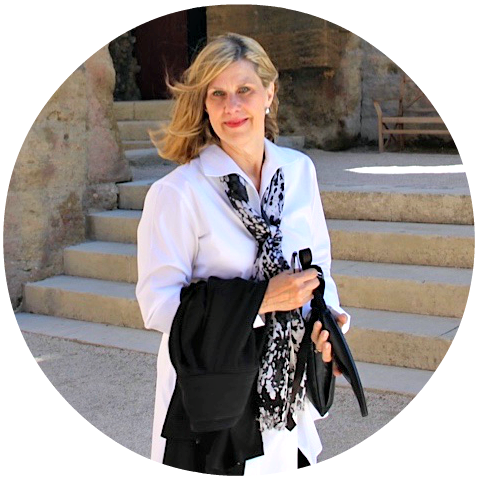 Bonnie thank you so very much for writing this post. 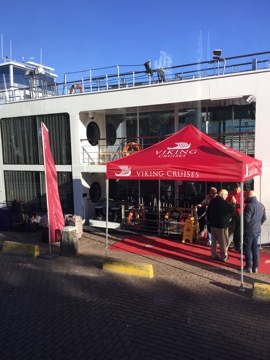 Every Sunday when I watch PBS I see the ads for Viking cruises and my husband has said many times that he would like to go. Now I won't hesitate. I can't wait for the rest of the report. Everything looks so good, Mama! The new layout is beautiful and I am so delighted that your trip was so wonderful. I'm looking forward to having more time to see all the pictures. beautiful! what an amazing anniversary present! i absolutely loved holland-we were there a few years ago for about 2 weeks, and it's where i would move to in an instant. i just fell in love with leiden, the town we were based out off. Looks fantastic! I see you sailed through Strasbourg - we were there this past summer. 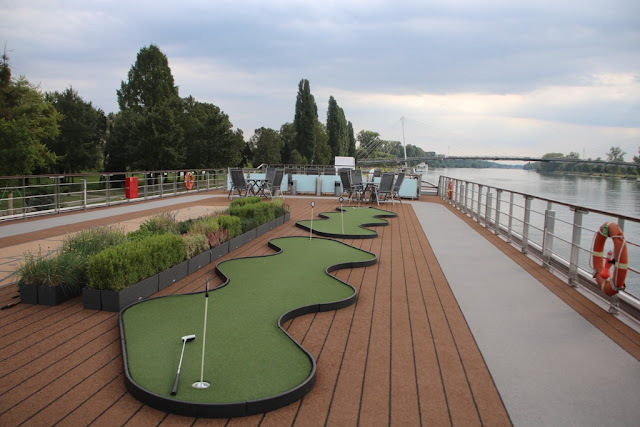 I would love to do a river cruise one day. What an incredible anniversary present! I love how the ship feels so intimate and I am impressed that the program director called everyone by name! It's little details like that which can make a trip extra special. It looks like you had a lovely time. 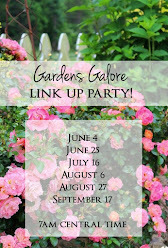 Thanks again for sharing at this month's Take Me Away party! 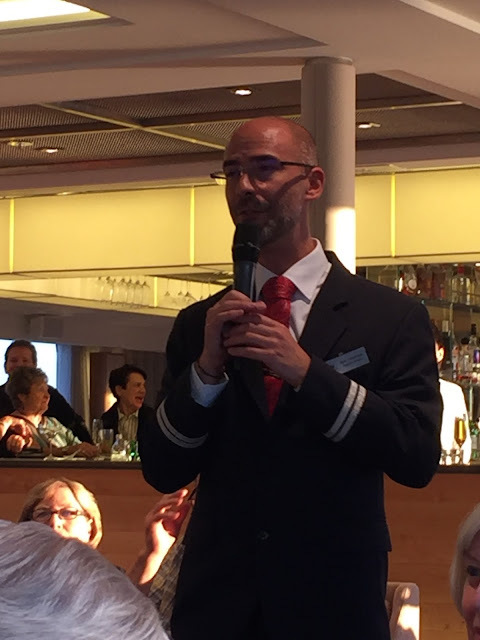 I have wanted to go on a Viking River Cruise and am interested in your review! 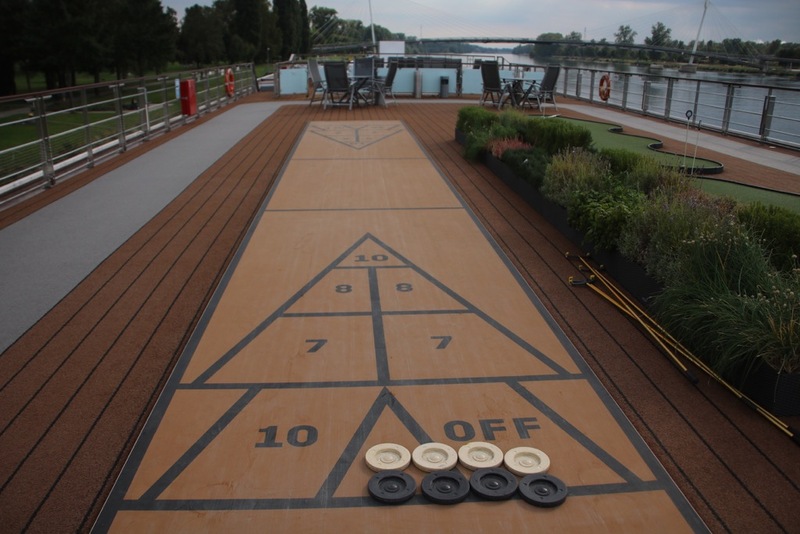 I have been on other cruise ships but never on a river cruise!! I know it is a smaller ship because obviously a larger one won't fit down the river! looking forward to more. This is something we've been thinking of doing. Glad it turned out so well for you. you've inspired me to get it planned.